Documentation of developmental issues is critical because the goal is accurately diagnosing each child and focusing appropriate resources toward the maximization of the child’s abilities. To accomplish this goal, the integrity of each patient’s chart with accurate and specific diagnoses is paramount. In addition, these conditions may affect the APR-DRG severity of illness (SOI) or risk of mortality (ROM). It also might affect the relative weight of the APR-DRG, but it will definitely affect the chart and possibly the start of services for the patient. Remember that early intervention programs, Medicaid, and commercial payers all require a diagnosis for authorization of services. Having these diagnoses clearly documented may also reduce the occurrence of “adverse events” in a pay-for-performance contract. If the comorbid conditions are clearly and specifically documented in the history and physical as a baseline for permanent or chronic conditions, this may decrease the risk for a hospital-acquired adverse event in conjunction with a hospital admission. In the assignment of clinical risk groups, the comorbid conditions of the last three years are taken into account in calculating the risk level of that child and therefore must be accurately documented. Clinical risk groups, a proprietary product of 3M™, are a population classification system that use diagnosis and procedure codes, pharmaceutical data, and functional health status to assign each individual to a single, severity-adjusted group. Children with multiple developmental comorbid conditions use more resources, require more time for education, and have a longer length of stay than children without developmental delays. That information will not be available to anyone—payer or provider—without accurate documentation. Children within a particular age bracket develop certain physical capabilities, such as vision, hearing, speech, mobility, and fine motor skills. Any aberrations in these developments may indicate simple delays or may be indicative of more serious diagnoses. When looking at the medical record, one must address vision, hearing, and speech delays or deficits; oral aversions and swallowing disorders such as those closely associated with speech deficits. Gross and fine motor delays or deficits are also areas to explore. Is the child able to walk, but not turn pages or pick up small items? If so, fine motor functionality may have been damaged or is not developing. Is it primarily gross motor, or fine motor? Are they unable to self-feed or self-care? Is there a provisional, or persistent tic disorder or Tourette’s Syndrome? The term “non-ambulatory” does not suffice as a diagnosis and needs to be further specified. Documenting the specific phase of swallowing impairment is essential—oral dysphagia, pharyngeal dysphagia, or oral-pharyngeal dysphagia. In a child, this may be the result of an hypoxic-ischemic encephalopathy event as a newborn, due to neuromuscular disease, due to traumatic brain injury, or simply the result of negative stimulation to the face/mouth while intubated/ventilated. The child now requires therapy to overcome that negative stimulation. Speech delays are closely related to feeding/swallowing issues and physicians need to document receptive and/or expressive speech impairment. For example, if the patient has a posterior fossa syndrome, they may simply have mutism. Simply documenting “non-verbal” does not bring an accurate diagnosis into the chart. Now consider vision. Consider cortical visual impairment, legal blindness, retinopathy of prematurity and, as a result, retinal detachment. CDI specialists need to question the underlying cause of the impairment such as chemotherapy that may have caused permanent blindness. The child may not receive the significant resources available to them if they’re not diagnosed and documented accurately. Lacking treatment in a very timely manner, permanent vision loss may occur when it could have been prevented. Of course, that must be clearly documented in problem lists and progress/office notes. Everyone must be aware of the diagnosis to allow safe, appropriate, and specialized care. ICD-10-CM has a code for all these situations, so CDI specialists need to make sure the documentation is present in the patient’s record to support code assignment. 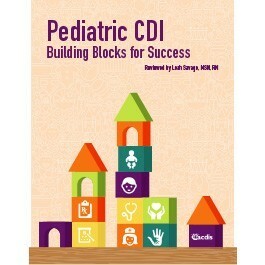 Editor’s note: This excerpt is adapted from the book Pediatric CDI: Building Blocks for Success.